The GBP/USD is trading on the downside sliding from near 1.3100 level after runup backed by market hoping for delay or no Brexit at all. The European Union’s Moscovici said the EU supported the idea of the second Brexit referendum saying it would be fully “legitimate”. Fresh Brexit headlines are awaited to push Sterling either direction. The GBP/USD is trading slightly on the downside at around 1.3035 area after the Brexit hopes for delayed Brexit combined with the European Union’s support for the second Brexit referendum saw the currency pair jumping to 1.3095 overnight. The European Commission’s Commissioner for Economic and Financial Affairs, Taxation and Customs Pierre Moscovici said the EU supported the idea of the second Brexit referendum saying it would be fully “legitimate”. Moreover, the EU chief Brexit negotiator Michel Barnier said the EU is ready to negotiate should the UK make compromises on the red lines. 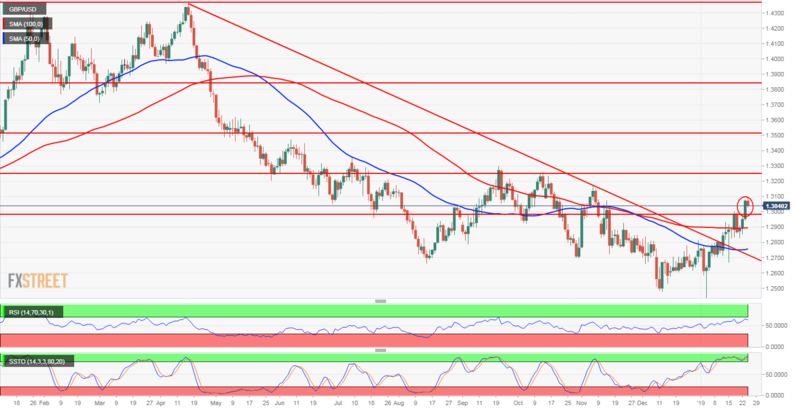 Technically the GBP/USD jumped above downward sloping trendline and breaking above 1.3000 it has also conquered the major resistance line representing 38.2% Fibonacci retracement of the upmove from 1.2130 to 1.4177. The technical oscillators including the Relative Strength Index and Slow Stochastics are both elevated with Slow Stochastics making the bearish crossover in the Overbought territory. The GBP/USD is correcting lower after the bullish breakout and the Fibonacci level of 1.2990 becomes a support level now and the first price target on the downside. On the upside, the immediate resistance is at around 1.3100.